This item was purchased by 123McK. 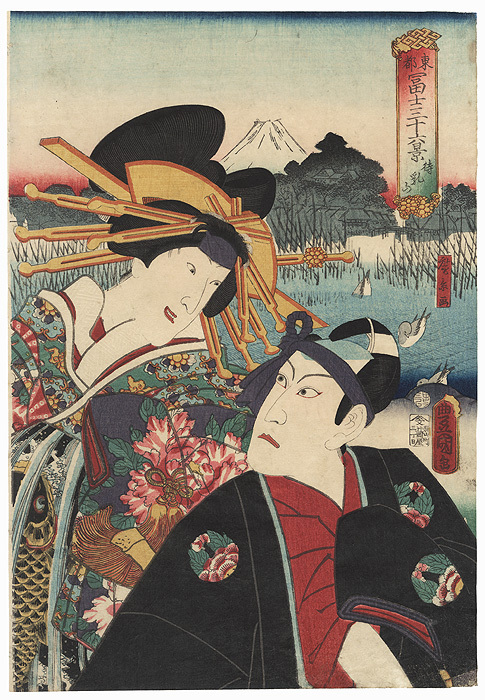 Sukeroku and Agemaki, 1860 - Terrific double portrait from the popular kabuki play "Sukeroku," which tells the story of a young otokodate or street knight named Sukeroku. 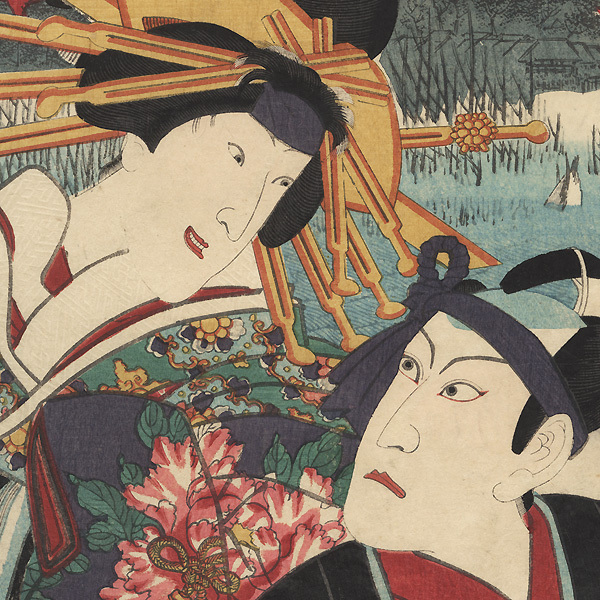 Here the lovely courtesan Agemaki meets with her sweetheart Sukeroku. The beauty smiles down at him, her open lips revealing tiny white teeth. She wears a striking kimono patterned with large chrysanthemum blossoms, tied with an obi featuring a carp leaping up a waterfall. Sukeroku stares up at her over his shoulder, a purple sash tied rakishly around his head. 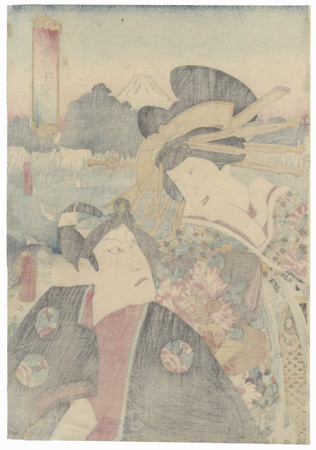 The landscape by Hirokage behind them shows a view of Mt. Fuji in the distance, rising above a marsh with water birds swimming and diving among the reeds. A wonderful design with large figures and a handsome composition. Nicely detailed with embossing on the white kimono collar, and burnishing on his black kimono. Condition - This print with excellent color and detail as shown. Stitching holes at side, tiny loss at corner, repaired. Slight toning and soiling, a few creases, slight rubbing at edges. Please see photos for details. Good overall.